There has been a phenomenal increase in the number of research papers with multiple authors. Increasing academic pressures and halo around individuals with prolific publications have made many aspirants to claim authorship. Increasing number of authors has brought its own issues of author credits, disputes, rivalry, and a degree of unwelcome scramble for credit sharing. Many unresolved issues about authorship and various guidelines and admonitions are more often infringed than adhered to. The position of the first and last author seem to be well recognized in medical and dental journals, but the fate of middle authors is left to guessing and often of inconsequential importance. Most of these issues, as well as fraud, misconduct in medical research publications, have been discussed amply but too of no avail. It is comforting to know that except for small shouts and whispers, dental research has been relatively free from scams and frauds. The complacency, however, needs to be tempered with constant vigil against fraud, falsification and fabrication of research reports. Honest authorship, vigilant editors, robust peer review, and a discerning readership are the sine qua non for a good research paper. Academic institutions and selection committees should be concentrating on the quality of research papers and not enamored of their number. Background: Smear layer removal and collagen fiber exposure may improve regeneration which can be accomplished by use of root biomodifiers. These enhance the degree of connective tissue attachment to denuded roots. The objective of this in vitro study was to evaluate and compare novel root canal irrigant and other root biomodifiers for smear layer removal on periodontally involved human teeth. Materials and Methods: Forty human teeth were collected and stored in saline. After scaling and root planing, two samples were obtained from each tooth. Thus, a total of 80 dentin blocks were randomly divided into four groups: Mixture of tetracycline, acid and detergent (MTAD), tetracycline hydrochloride (TTC HCl), citric acid (CA), and ethylenediaminetetraacetic acid (EDTA). The agents were applied for 3 min by active burnishing. Immediately following treatment, the specimens were rinsed, dehydrated, fixed and prepared for scanning electron microscope and were examined at Χ 3500 magnification. Sampaio's index was evaluated by the previously trained blind examiner using photomicrographs. Groups were compared using analysis of variance followed by Tukey's post-hoc test. Results: Mixture of tetracycline, acid, and detergent is most efficacious in removing the smear layer and showed statistically significant dentinal tubules opening, followed by EDTA, TTC HCl, and CA. Conclusion: Mixture of tetracycline, acid and detergent and conventional root biomodifiers used in the study alters the dentin surface by smear layer removal and exposure of dentinal tubules. Hence, MTAD as a root biomodifier may have a significant role in periodontal regeneration . Purpose: So far, definitive implant abutments have been performed with high elastic modulus materials, which prevented any type of shock absorption of the chewing loads and as a consequence, the protection of the bone-fixture interface. This is particularly the case when the esthetic restorative material chosen is ceramic rather than composite resin. The adoption of an anisotropic abutment, characterized by an elastic deformability, could allow decreasing the impulse of chewing forces transmitted to the crestal bone. 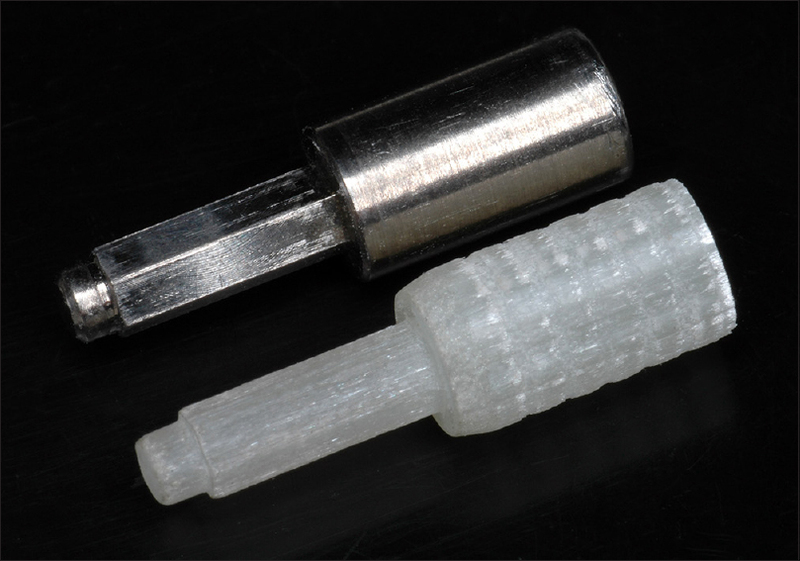 Materials and Methods: According to research protocol, the mechanical resistance to cyclical load was evaluated in a tooth-colored fiber-reinforced abutment (TCFRA) prototype and compared to that of a titanium abutment (TA), thus eight TCFRAs and eight TAs were adhesively cemented on as many titanium implants. The swinging that the two types of abutments showed during the application of sinusoidal load was also analyzed. Results: In the TA group, both fracture and deformation occurred in 12.5% of samples while debonding 62.5%. In the TCFRA group, only debonding was present in 37.5% of samples. 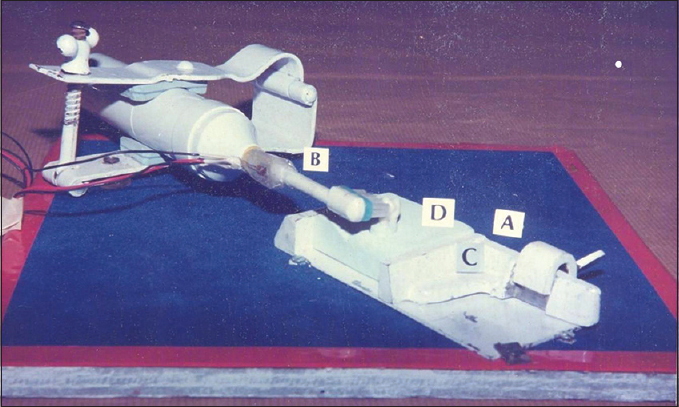 In comparison to the TAs, the TCFRAs exhibited a greater swinging during the application of sinusoidal load. In the TA group, the extrusion prevailed, whereas in the TCFRA group, the intrusion was more frequent. Conclusion: The greater elasticity of TCFRA to the flexural load allows absorbing part of the transversal load applied on the fixture during the chewing function, thus reducing the stress on the bone-implant interface. Background: The quantification of the dental plaque (DP) by indices has limitations: They depend on the subjective operator's evaluation and are measured in an ordinal scale. The purpose of this study was to develop and evaluate a method to measure DP in a proportional scale. 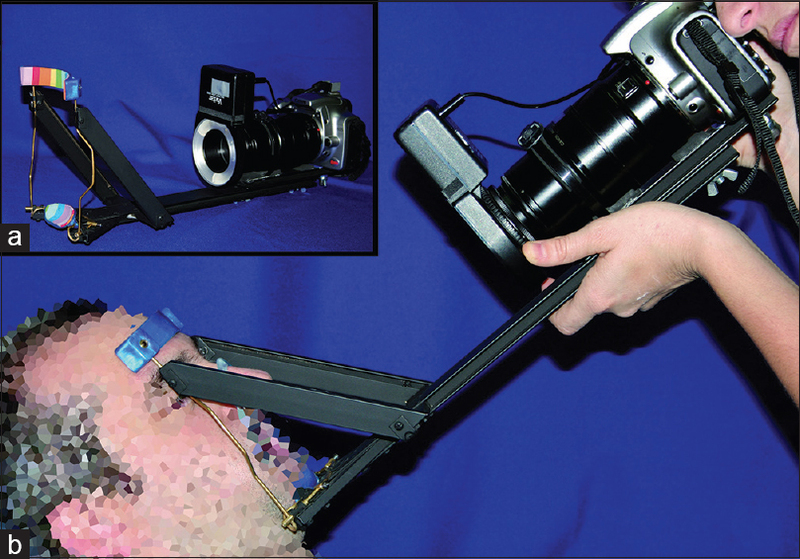 Materials and Methods: A portable photographic positioning device (PPPD) was designed and added to a photographic digital single-lens reflex camera. Seventeen subjects participated in this study, after DP disclosure with the erythrosine, their incisors, and a calibration scale ware photographed by two operators in duplicate, re-positioning the PPPD among each acquisition. A third operator registered the Quigley-Hein modified by Turesky DP index (Q-H/TPI). After tooth brushing, the same operators repeated the photographs and the Q-H/TPI. The image analysis system (IAS) technique allowed the measurement in mm 2 of the vestibular total tooth area and the area with DP. Results: The reliability was determined with the intra-class correlation coefficient that was 0.9936 (P < 0.05) for the intra-operator repeatability and 0.9931 (P < 0.05) for inter-operator reproducibility. The validity was assessed using the Spearman's correlation coefficient that indicated a strong positive correlation with the Q-H/TPI rs = 0.84 (P < 0.01). The sensitivity of the IAS was evaluated with two sample sizes, only the IAS was able to detect significant differences (P < 0.05) with the sample of smaller size (n = 8). Conclusions: Image analysis system showed to be a reliable and valid method to measure the quantity of DP in a proportional scale, allowing a more powerful statistical analysis, thus facilitating trials with a smaller sample size. 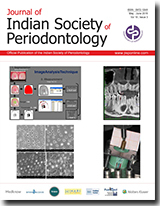 Aims: The aim of the present study was to evaluate the accuracy of Cone Beam Computed Tomography (CBCT) measurements of alveolar bone defects caused due to periodontal disease, by comparing it with actual surgical measurements which is the gold standard. Methods and Material: Hundred periodontal bone defects in fifteen patients suffering from periodontitis and scheduled for flap surgery were included in the study. On the day of surgery prior to anesthesia, CBCT of the quadrant to be operated was taken. After reflection of the flap, clinical measurements of periodontal defect were made using a reamer and digital vernier caliper. The measurements taken during surgery were then compared to the measurements done with CBCT and subjected to statistical analysis using the Pearson's correlation test. Results: Overall there was a very high correlation of 0.988 between the surgical and CBCT measurements. In case of type of defects the correlation was higher in horizontal defects as compared to vertical defects. Conclusions: CBCT is highly accurate in measurement of periodontal defects and proves to be a very useful tool in periodontal diagnosis and treatment assessment. Aim: The purpose of this study was to compare the validity of alveolar ridge measurements obtained with ridge mapping (RM) technique against cone beam computed tomography (CBCT) measurements. Materials and Methods: Twenty partially edentulous patients were recruited for implant placement in the Clinic of San Martin de Porres University. For all the measurements, a vacuum-formed stent was fabricated for each subject. A buccal and lingual point was made in the stent to provide a reference of measurement for each implant site. RM measurements with the stent were obtained before and after surgical flap reflection. Two calibrated observers made the CBCT images measurements. T-test was used for the statistical analysis. Values <0.05 were considered statistically significant. Also, specificity and sensibility of CBCT and RM were compared. Intra-class correlation coefficient (ICC)_ was measure between CBCT measurements. Results: A total of 62 implants sites were evaluated. No statistical significant differences were obtained with CBCT and RM measurements (P = 0,207). Detecting proper buccal-lingual ridge, the sensitivity and specificity were 59% and 91% for RM while CBCT obtained 92% of sensitivity and 94% of specificity. Concordance was found "good" (ICC 0.82). Conclusion: Both methods provide valid measurements. Even though, we found diagnostic limitations in the RM, it demonstrated to be a useful method for its exactitude, low cost, the immediate result and no need of radiation. CBCT was recommended when the bone ridge width and height were in the less than ideal for conventional dental implant placement. Background: Periodontitis is a chronic, multifactorial, polymicrobial disease causing inflammation in the supporting structures of the teeth. There is a plethora of nonoral risk factors which can be quoted to aid in the development of chronic periodontitis. According to WHO, depression is a common mental disorder that presents with depressed mood, loss of interest or pleasure, feelings of guilt, disturbed sleep or appetite, low energy and poor concentration. Depression is associated with negligent oral health care and another mechanism proposed disturbance in the hypothalamic-pituitary axis system and hypothalamic-pituitary-thyroid system, which can affect the periodontal status by affecting the immune system. Aim: The aim of this study was to assess the association between periodontal clinical parameters and depression rating. Subjects and Methods: The study design is a case-control study with 35 patients each in case and control group. The periodontal parameters taken for measurement were probing depth and clinical attachment loss. Depression was calculated using Beck's depression scale. Statistical Analysis: The statistical analysis was performed by means of SPSS software (SPSS Inc., Chicago, IL, USA; version 17.0 under windows 2000). Student's t-test was used to determine the relationship between the clinical periodontal parameters and depression. Results: Self-reported scoring of depression by using Beck's depression inventory has shown that periodontal patients had a significantly higher total depression score than normal controls. Conclusion: This study reveals that there is a direct correlation between the severity of periodontal disease and the severity of depression in patients. Background: Both chronic kidney disease (CKD) and its treatment can affect a wide range of tissues and systems. It directly or indirectly affects flow, concentrations and composition of saliva. Hemodialysis can effectively minimize most of these complications to some extent. Aims: The main aim of this study was to know the salivary content of sodium, potassium, calcium, urea, bicarbonate and oral manifestations in patients with CKD. Subjects and Methods: For this study, 50 patients diagnosed with CKD and 50 systemically and periodontally healthy individuals were subjected to a detailed general and intraoral examination. Whole un-stimulated saliva samples of all the selected subjects were collected and subjected to calcium (Ca), phosphorous (P), sodium (Na), potassium (K), bicarbonate and urea analysis. Statistical Analysis Used: Paired t-test, Mann-Whitney test. Results: Among 50 study subjects, 26 subjects had reduced salivary flow in the range of 0.1-0.4 ml/min. Intraoral examination of the study subjects revealed pallor, increased deposition of calculus, bleeding gums, metallic taste, hypoplasia of teeth and fissured tongue. There was a significant difference between healthy and prehemodialysis patients in the salivary sodium, potassium, calcium, phosphorus, urea levels and the difference was insignificant in relation to bicarbonate levels. Conclusions: Alterations in salivary calcium, phosphorous, urea, sodium, potassium levels were significantly higher in the study groups when compared to control groups and the difference was insignificant in relation to bicarbonate level. The increased levels in dialysis patients correlated with renal disease severity. Background: Sleep deprivation has become a global phenomenon, and epidemiologic data indicate that short sleep duration adversely impacts human physical health. Underlying mechanisms involve modulation of immune-inflammatory mechanisms. These changes might contribute to potentiation of destructive periodontal disease. Therefore, the present study aimed to assess if there is an association of sleep deprivation with chronic periodontal diseases. Materials and Methods: Sixty subjects were categorized into 3 groups (n = 20 each) viz. clinically healthy, gingivitis and periodontitis. 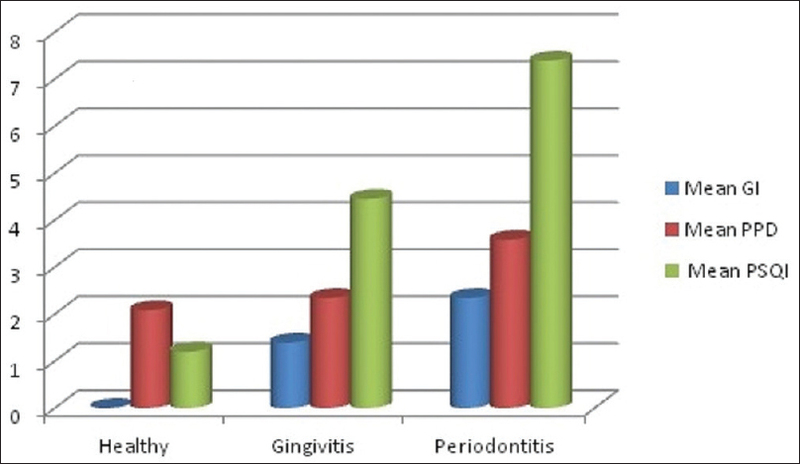 Periodontal status of subjects was assessed by gingival index and pocket probing depth. All the study subjects were administered Pittsburgh Sleep Quality Index (PSQI) questionnaire for the assessment of sleep deprivation. Results: Present investigation revealed that mean PSQI was highest in the periodontitis group as compared to other two groups and the difference among three groups was statistically significant. Conclusion: The present study with preliminary results suggestive of the association of sleep deprivation with severity of periodontal disease, definitely calls on for future studies with larger samples. Background: Gingival overgrowth (GO) is a known side-effect of calcium channel blockers. Although there have been several case reports, few studies have examined the prevalence of nifedipine, diltiazem, and amlodipine. This study was conducted to determine the prevalence and risk factors for GO in patients treated with calcium channel blockers. Materials and Methods: A cross-sectional study was conducted in out patient Department of Medicine, Government Medical College, Calicut. 133 patients taking antihypertensives were examined for the presence of GO using two different indices: Vertical GO in 6 points around each tooth and horizontal Miranda-Brunet index in the interdental area. Gingival index (GI), plaque index, and probing depth were also evaluated. Results: The frequency of GO was significantly higher in nifedipine-treated cases than other drug groups. Frequency of GO was 75% for nifedipine, 31.4% for amlodipine and 25% for amlodipine + metoprolol. Higher gingival, plaque and calculus were observed in patients taking calcium channel blockers. Among the possible risk factors, only the GI showed a significant correlation with GO. Conclusions: Patients taking antihypertensives had poor oral hygiene. Patients taking nifedipine showed a higher frequency of GO. Gingival inflammation acts as a predisposing factor. Background: Periodontal disease is one of the most prevalent dental diseases, which affects the adult population of the world, varying only in degree from mild to severe. Transport industry is considered an important pillar for socioeconomic development of any nation. The present study was carried out to assess the periodontal health status of transport workers working in Chandigarh Transport Undertaking (CTU) buses, Chandigarh (Union territory). Materials and Methods: A cross-sectional study was conducted on all available CTU workers at all three bus depots. The data were recorded on a modified WHO format (1997). A total of 998 subjects were included for community periodontal index (CPI) and attachment loss computations after doing necessary exclusions. 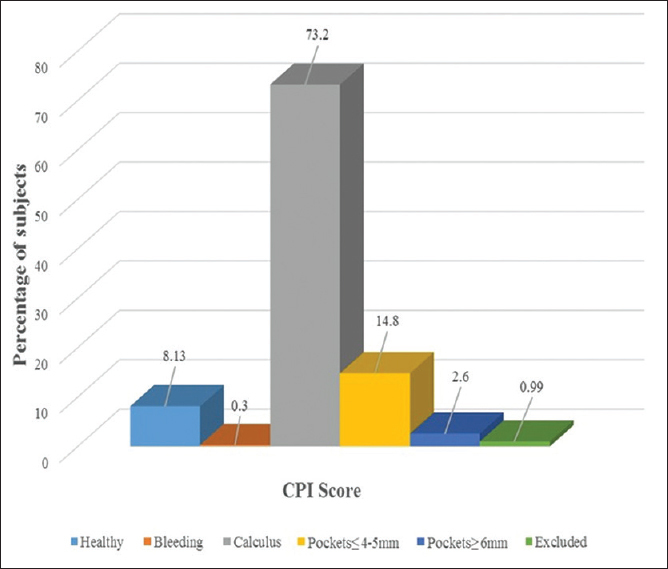 Periodontal status was evaluated using CPI. Results: About 8.13% of the subjects had healthy periodontium while maximum subjects (73.2%) had a score 2 (calculus) as evaluated by CPI. 3.4% (12) of the subjects belonging to upper middle class had deep pockets as compared to 1.9% (10) of the subjects in the lower middle class. None of the subjects in the upper high, high, and upper middle socioeconomic status (SES) category had a loss of attachment score 4. 25.9% of the postgraduates had a CPI score of 0 whereas 0.7% high school subjects had a loss of attachment score 4. Conclusion: Advanced periodontal disease (CPI score, 4) affected small number of subjects with maximum subjects (73%) having a CPI score of 2. There was statistically significant association of SES and education level with the CPI score and loss of attachment level. Background: The habit of tobacco consumption has plagued all nations from time immemorial. While tobacco use is decreasing in many developed countries, it is increasing in developing countries like India. Health care professionals have a key role to play to motivate and advise tobacco users to quit. Aim: The aim was to assess the attitudes and practice of dental professionals in Mumbai and Navi Mumbai toward tobacco cessation and the potential barriers faced. Subjects and Methods: Questionnaire-based survey was conducted with 500 dental surgeons in Mumbai and Navi Mumbai. 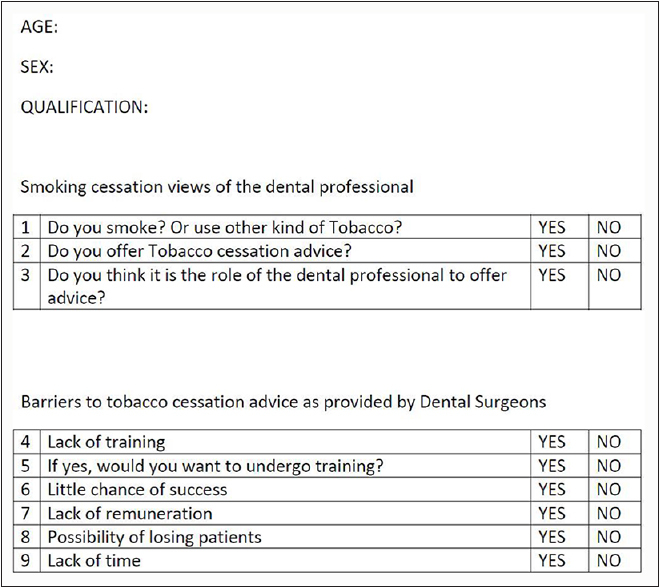 The questionnaire contained close-ended questions and assessed the smoking status of the professional, whether they impart tobacco cessation advice to their patients, whether the professional is trained for basic intervention, whether they would be eager to undergo training and also the potential barriers encountered by the professional. Statistical Analysis Used: The SPSS version 17 was used. Frequencies and percentages were used to determine distributions of the responses for each of the variables. Chi-square test was used for analysis. Results: It was observed that the majority of dental clinicians do not use tobacco and although 93% believed that it is the role of the dental professional to offer advice, 21% do not. Potential barriers reported were: Little chance of success, lack of training, lack of time, lack of remuneration, and the possibility of losing patients. Conclusions: Dental professionals must expand their horizon and armamentarium to tobacco intervention strategies inclusive of their regular preventive and therapeutic treatment modalities. Furthermore, the dental institutions (schools) should include tobacco intervention in the curriculum, but it should not be just theoretical knowledge rather it must have a practical component. Background: An association between oral conditions such as periodontal diseases and systemic conditions is noted. As such, periodontal disease is associated with an increased risk of systemic illnesses such as cardiovascular disease, diabetes, adverse pregnancy outcome, atherosclerosis, stroke and hospital acquired pneumonia. The concept of diagnosing and treating a potential patient to minimize the deleterious effects of this chronic infectious and inflammatory condition on systemic conditions represents both an unprecedented challenge and opportunity to our profession. Keeping this in view, the present survey was designed to evaluate the acquaintance, orientation and behavior of general medical practitioners; concerning the effects of periodontal disease on systemic health. Materials and Methods: A typed questionnaire carrying four sets of questions was distributed among general medical practitioners of seven different government and private medical colleges and hospitals. Questionnaire was developed to assess the acquaintance, orientation and behavior of general medical practitioners toward periodontal disease. Results: Most of the respondents have knowledge regarding the signs and symptoms of periodontal disease and its association with cardiovascular disease. However, majority of them do not know about the potential effect of periodontal disease on other organ systems. Conclusion: General medical practitioners have inadequate knowledge regarding periodontal diseases. Hence, oral health related training should be an integral part of the medical curriculum. Pulse or hyaline ring granulomas are rare but are well-defined oral and extraoral lesions due to implantation of the cellulose moiety of plant foods in contrast starch components. A unique form as reactive gingival growth showing histologic features of oral pulse or hyaline ring granuloma (OPHRG) which had resulted from implantation of food particles of plant or vegetable origin into the periodontium has been illustrated. 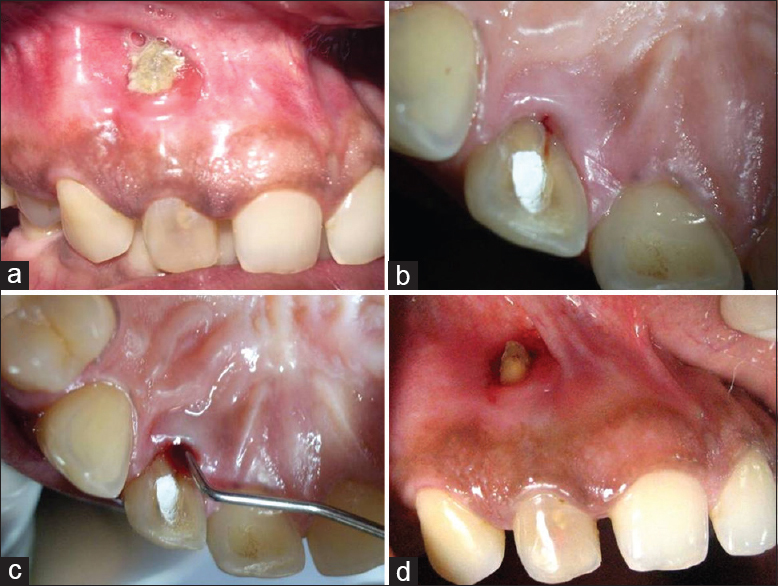 Such a presentation is attributable to compromised periodontal health and poor oral hygiene favoring the implantation of food particles has been described here along with a literature update on OPHRG. Peripheral cement-ossifying fibroma (PCOF) is a rare osteogenic neoplasm that ordinarily presents as an epulis-like growth. It frequently occurs in maxillary anterior region in teenagers and young adults. We report a case of PCOF in a 42-year-old male, which was previously surgically excised and recurred after a period of 2 years. PCOF should be considered in the differential diagnosis of reactive hyperplastic lesions originating from gingiva. Hence, early diagnosis with proper surgical excision and aggressive curettage of the adjacent tissues is essential for prevention of recurrence. Eyes don't see what mind does not know. It is important for a clinician to refresh his knowledge frequently to recognize some of the conditions that one may come across rarely no matter how insignificant the condition may seem. Especially in a dental outpatient department setting, individuals may complain of varied symptoms which the clinician, often tends to correlate to one of the oral diseases. We present a case of Eagle's syndrome with vague clinical presentation which could have easily gone undiagnosed if not for the application of simple diagnostic procedures and aids like Orthopantamogram (OPG). 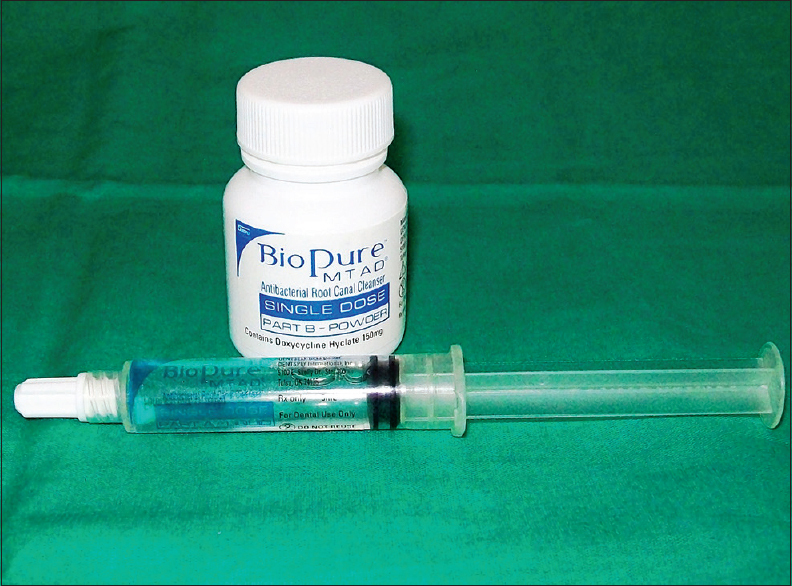 Foreign bodies may be ingested, inserted or deposited in the oral cavity. Iatrogenic foreign bodies such as impression material, amalgam, broken instruments, needles etc., are commonly encountered. These foreign bodies are generally symptomatic and show signs of inflammation pain and purulent discharge. An unusual case of asymptomatic traumatic foreign body (stone) impacted in the lower anterior region due to an accident 3 years back, which was diagnosed during routine oral examination is reported. 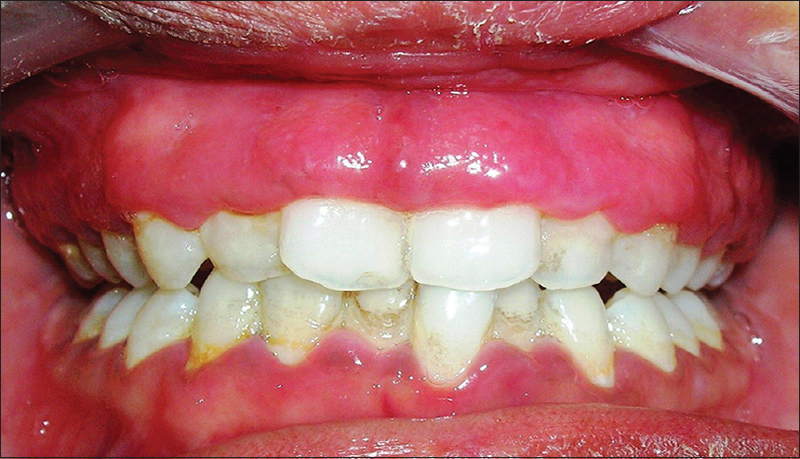 Hereditary gingival fibromatosis (HGF) is a rare hereditary condition characterized by slow, progressive, nonhemorrhagic, fibrous enlargement of gingiva due to increase in sub-mucosal connective tissue component. This paper presents a case report of an 18-year-old female suffering from HGF with positive family history. Her 42-year-old mother also have enlargement of the gums. After through clinical examination of both the patients, routine blood investigation was advised. All the investigations were within normal physiological limits of both the patients. Surgical excision of enlarged gingival tissue was planned after meticulous scaling and root planing. Patients were recalled 1 week after surgery. Postoperative healing were good and desired crown lengthening was achieved with significant improvement in speech and masticatory problems in both the patients. There was no recurrence of the disease even after 2 years follow-up. Dentinal hypersensitivity and unesthetic appearance are common findings after excision of an epulis due to exposure of root and underlying bone. The simultaneous placement of subepithelial connective tissue grafting after excision of the lesion seems to be viable surgical option in such cases. Furthermore, this will avoid second surgical procedure for the management of the residual gingival defect. Mucosal fenestrations, wherein the tooth root apices are clinically discernible in the oral cavity subsequent to loss of overlying alveolar bone and mucosa, are rare pathologic entities. Palato gingival grooves- anatomic aberrations are also infrequent occurrences that notoriously predispose to periodontal pathologies of varying extent. Both conditions independently are known to popularly affect maxillary lateral incisors. Coexistent fenestration defect and palato gingival groove in the same tooth is extremely rare and undoubtedly is a perfect combination to precipitate severe endodontic-periodontal consequences. 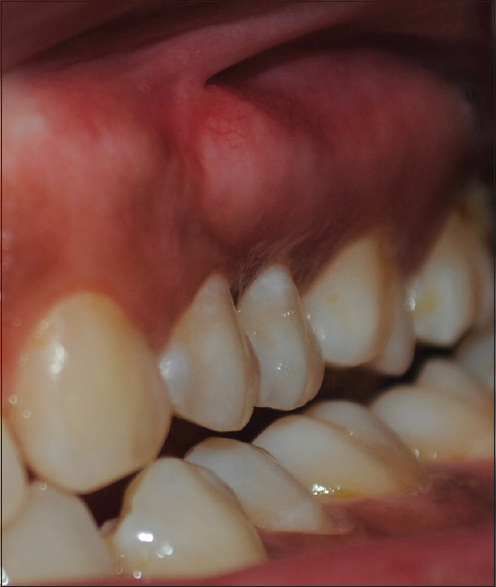 In this report, a 34-year-old patient presented to the dental department with complaint of esthetics in relation to exposed root of right maxillary lateral incisor. On closer inspection, a palato gingival groove in addition to fenestration defect was evident on the root surface along with a periodontal pocket of >5 mm. 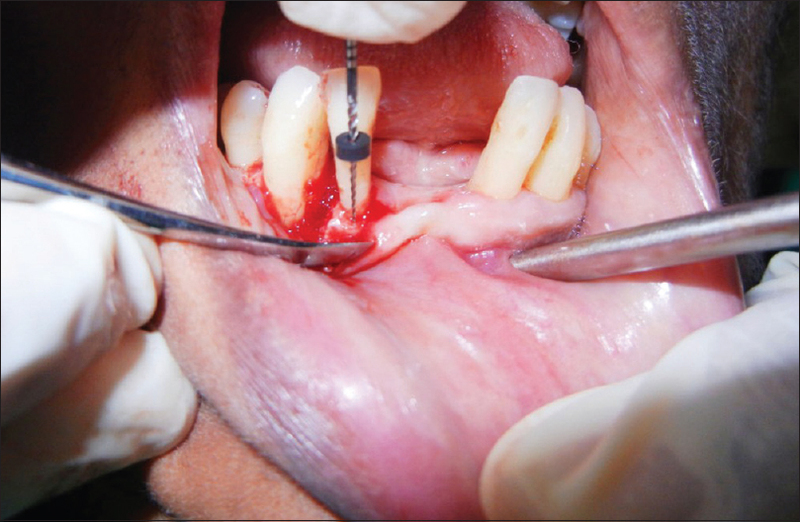 An interdisciplinary treatment was instituted which included endodontic treatment followed by root end resection, osseous bone graft placement and guided tissue regeneration procedures for repair of mucosal fenestration defect. Debridement of the palatal pocket, with saucerization of the groove and restoration with glass ionomer cement were simultaneously employed to correct the palatal defect. Buccal exostosis is benign, broad-based surface masses of the outer or facial aspect of the maxilla and less commonly, the mandible. They begin to develop in early adulthood and may very slowly enlarge over the years. 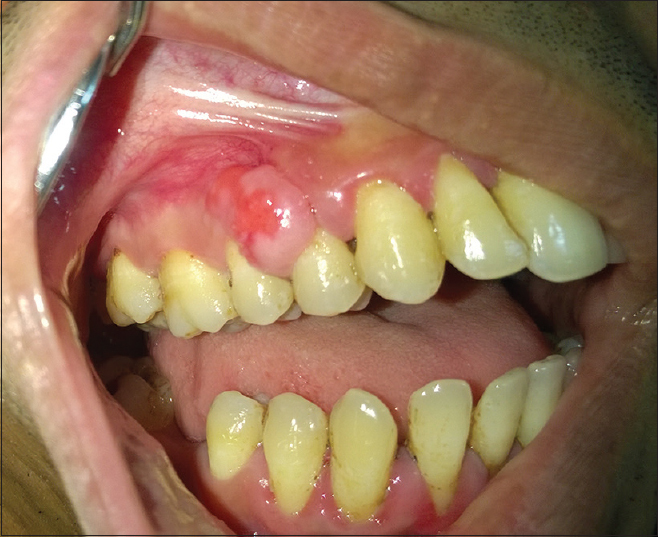 A 24-year-old female presented with gingival enlargement on the buccal aspect of both the quadrants of the maxillary arch. The overgrowth was a cosmetic problem for the patient. 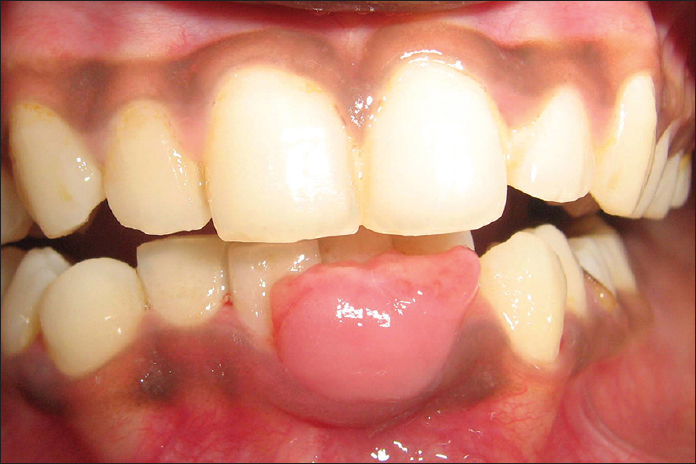 The etiology of the overgrowth remains unclear though the provisional diagnosis indicates toward a bony enlargement, which was confirmed with the help of transgingival probing. The bony enlargement was treated with resective osseous surgery. 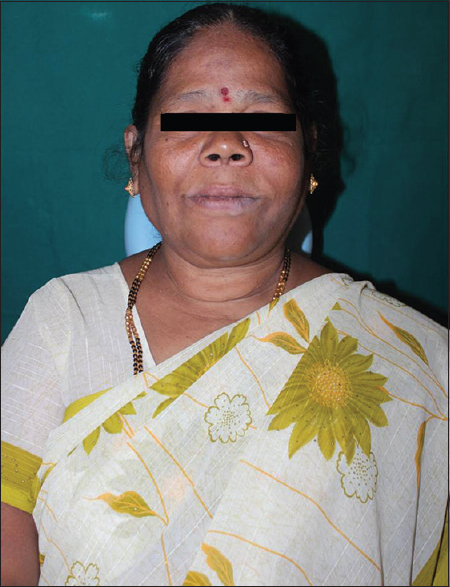 The following paper presents a rare case of the bilateral maxillary buccal exostosis and its successful management. Gummy smile has been an esthetic concern for many patients. 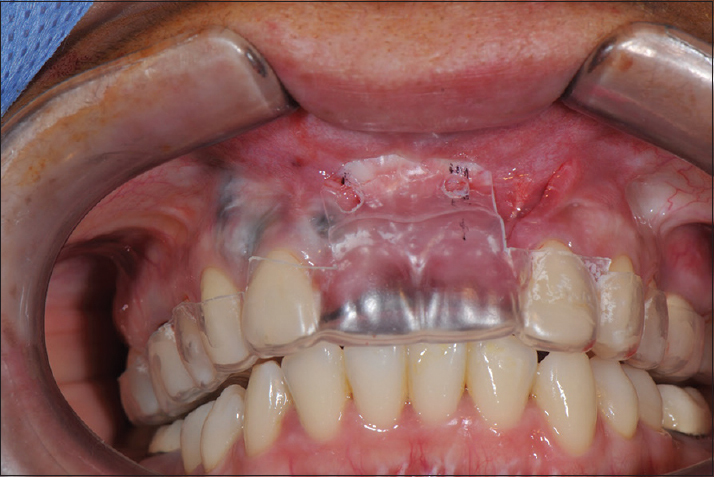 This clinical report describes a successful surgical coverage obtained by modified lip repositioning, thus surgically treating the gummy smile. The technique was performed to limit the retraction of elevator muscles (e.g., zygomaticus minor, orbicularis oris, leviator anguli oris and levator labi oris.) The technique is fulfilled by removing two strips of mucosa from maxillary buccal vestibule on both the sides leaving the frenum untouched and creating a partial thickness flap between mucogingival junction and upper lip musculature, and suturing the lip mucosa with mucogingival junction, resulting in a narrow vestibule and restricted muscle pull, thereby reducing gingival display. This technique is different from the conventional surgical lip repositioning as labial frenum is left untouched over here as it helps in maintain Litton the midline for lip repositioning and reduces the morbidity associated with it.